We are committed to your top-notch administrative experience. Our excellent professional services are matched to a stellar administrative experience. We configure our schedule for optimum results. Dr. Tsintolas arranges his schedule so he can devote attention to every patient. It is important to us to respect your time and we always strive to run on time. Dr. Tsintolas cements all brackets and bands himself. Exact placement of brackets and bands is essential to efficient tooth movement. Dr. Tsintolas is the expert and he cements all brackets and bands himself. All orthodontic consultations are cost-free and pressure-free. Dr. Tsintolas’ orthodontic consultation is priceless, but he offers it free! Dr. Tsintolas performs a thorough exam and presents his vision for the most efficacious and appropriate treatment for your particular needs. You will never be coerced to accept and begin treatment on the same day as your consultation. Trustworthy treatment recommendations are the only ones Dr. Tsintolas offers. Feel confident that Dr. Tsintolas only recommends indicated treatment and always selects the most conservative and effective techniques appropriate for the individual. Trust in Dr. Tsintolas to only suggest orthodontic treatment when and if it is truly necessary. Early, interceptive care can make a world of difference. As a specialist in orthodontics and dentofacial orthopedics, Dr. Tsintolas is qualified to evaluate for early interceptive care and carefully identify only those patients for whom this course of treatment will be advantageous. Around-the-clock online access to treatment and account details; pajamas optional. Our practice offers secure, 24/7 online access to review appointments and account details and pay online. Dr. Tsintolas is a specialist in orthodontics and dentofacial orthopedics. When you consult with Dr. Tsintolas, you access the expertise of a specialist in orthodontics and dentofacial orthopedics who is fully trained and experienced to offer customized treatment options for optimal results. Never settle for a one-size-fits-all approach relegated to nonspecialists. Dr. Tsintolas is the orthodontist chosen by multiple generations of families. From grandparents to grandchildren, Dr. Tsintolas cares for the entire extended family. Dr. Tsintolas is particularly honored when former patients, now adults, bring their own children to him for orthodontic care. As an orthodontic specialist, Dr. Tsintolas offers a full range of orthodontic treatment options. Dr. Tsintolas has at his disposal a hand-selected array of cutting-edge treatment options that are proven to comfortably deliver optimum results. General dentists and relevant dental specialists are in the loop. Orthodontics is not performed in isolation. We communicate and coordinate with your dentist and relevant dental specialists. We share X-rays with your dental community as a courtesy. Help is available should an orthodontic emergency arise. While orthodontic emergencies are rare, Dr. Tsintolas is only a phone call away, 24/7. Dr. Tsintolas arranges for a qualified dental professional to assist his patients if he is unable to be your emergency contact. We want you to always feel good about visiting us. We work hard to provide an office environment that is friendly, inviting and professional for all our patients and their families. 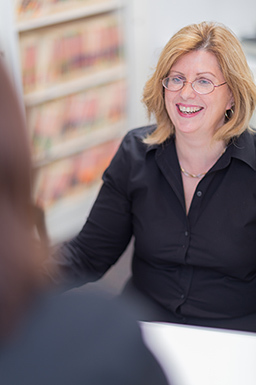 We offer all the benefits of an established practice. Dr. Tsintolas’ practice is well-established in this area and he will be here for your current and future needs. All the conveniences of one office location, and none of the headaches of multiple-office practices. Scheduling is easy and patients always know where to find us because we have only one location. If an unexpected concern arises, if you like to schedule on specific days or times, or if you wish to reschedule an appointment, you will never be forced to travel out of your way to an unfamiliar and inconvenient second or third satellite office. Dr. Tsintolas is always available to you in the same accessible location. Everyone is a beneficiary of Dr. Tsintolas’ extensive experience. 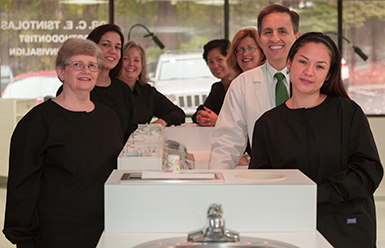 Dr. Tsintolas established his orthodontic practice in Gaithersburg, MD in 1987. His experience and expertise is an asset to individuals of all ages. Our daily mission is to serve you. Dr. Tsintolas and his team dedicate themselves every day to wowing you. From the moment you enter our practice, we want you to feel welcome, appreciated and comfortable. We are here to serve you to the very best of our abilities. Dr. Tsintolas is dedicated to an evolving and improving practice. Complacent, static and stagnant we are not. We constantly search for and implement improvements to our care and services. We welcome and listen to feedback and suggestions from patients and their families. Dr. Tsintolas is dedicated to maintaining your smile for a lifetime. Retainers hold teeth in their final positions. One set of retainers is included in the cost of your treatment. All patients are encouraged to return to the office on an annual or as needed basis to maintain a good fit of the retainers. Our orthodontic monitoring program is offered at no charge. Dr. Tsintolas and the American Association of Orthodontists strongly encourage the first visit to the orthodontist by age 7 – earlier if there is any concern, question or worry. Dr. Tsintolas provides an honest assessment of your child’s current and future orthodontic needs. If it is best to afford your child more time for tooth eruption and jaw growth, Dr. Tsintolas suggests your child return to the office for periodic monitoring at no charge. Rest assured, the doctor’s priority is the individual child. He will not recommend unnecessary treatment, nor will he push treatment earlier than optimal. We make your insurance easy. Dr. Tsintolas is a participating specialty provider with most insurance plans. Our office prepares and electronically submits all claims on your behalf to assist you in accessing your full insurance benefit. 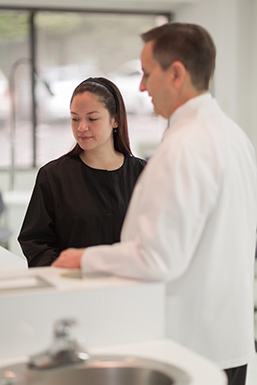 We make paying for and affording orthodontic care easy. Dr. Tsintolas offers competitive fees for his expert services. An interest-free loan is extended for every treatment fee as a courtesy. The practice does not outsource the loan, which eliminates the headache of loan applications and paperwork. We offer a Thank You Discount of 5 percent when a qualifying treatment fee is paid in full with a check at the start of treatment. A popular option is Hands-Free Payments; we automatically charge your MasterCard, Visa, or Discover monthly. Secure, online payments are possible around-the-clock. Dr. Tsintolas appreciates his staff and knows you will, too. Our clinical staff are highly trained and are certified by the State of Maryland as Dental Radiation Technologists and Qualified Orthodontic Assistants. They update their many skills throughout the year. Our administrative staff are also trained and skilled to provide you with the best service. Sterilization and safety is important to you and it is important to us. We utilize single-use, disposable tools and materials whenever feasible- and we properly discard them after each use. Non-disposable equipment and tools are always thoroughly cleaned and then sterilized after every use. Hand hygiene before every patient, protective eyewear, and face masks are visible steps we take to protect our patients. We maintain a clean office and adhere to strict guidelines. We care for dental and medical professionals and their families. Many area dentists, dental specialists, and physicians have chosen Dr. Tsintolas for their treatment, and for the treatment of their families and staff. Wi-Fi is available to all patients and visitors to our practice. We offer wi-fi as a nice convenience that makes for a happier office experience.